See Southern Italy’s most historically prominent destinations with a full day Naples and Pompeii shore excursion, including a Naples city tour and a visit to the ominous ancient city of Pompeii. Your private English-speaking driver will pick you up in a luxury vehicle at your ship to embark on an exploration of Naples. Wander vibrant streets, witness fascinating monuments and enchanting panoramas of the Bay of Naples, and, of course, indulge in a tasting of the world’s most famous pizza, along with some equally esteemed espresso and gelato. After you’ve been introduced to Naples, carry on to the city frozen in time. 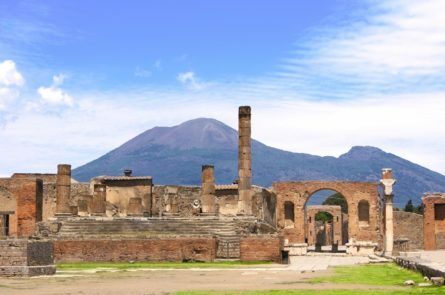 Discover the ruined city of Pompeii and gain insight into the life that once was in this Roman settlement, before the sudden and raging eruption of Mount Vesuvius in 79 AD. At the end of your visit sit back and relax as your driver returns you to your ship. Explore Underground Rome and the Appian Way from the Capuchin Crypt (Bone Church) to the Catacombs in the company of an English-speaking expert guide. Discover layers of history piled atop one another at the Basilica of San Clemente. End your journey through the centuries along the Appian Way and marvel at the Roman Catacombs, underground burial chambers where millennia of history are unveiled among tombs and memorials.